I'm selling my used Panasonic Leica DG Summilux 12mm f/1.4 ASPH. Lens w/ Tiffen Variable ND Filter. Comes with everything it origially came with in box. The lens hood has some scratches on it but everything else is perfect. Comes with box, manual, pouch, lens caps, lens and Tiffen variable ND filter. Please tap here to refer full description!. Panasonic LUMIX for Micro Four Thirds G LEICA DG SUMMILUX 12mm /F1.4 ASPH. Our Products are 100% Authentic! I am sorry for poor English. I’m Japanese living in JAPAN. (it might be more than a month). so, do not worry about it. It takes a while (depends on a country but about a month). 5 out of 5 stars - Panasonic LUMIX for Micro Four Thirds G LEICA DG SUMMILUX 12mm /F1.4 ASPH. 3 product ratings3 product ratings - Panasonic LUMIX for Micro Four Thirds G LEICA DG SUMMILUX 12mm /F1.4 ASPH. 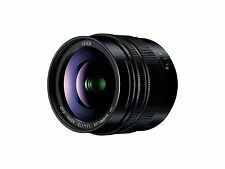 Large-aperture wide-angle lens F1.4 "SUMMILUX" lens ?. Correct sagittal flare thoroughly from opening to the periphery of the screen ?. Supports high-quality shooting with high-speed and high-precision AF / For ordering I need your help by one person. Panasonic LEICA DG SUMMILUX 12mm F1.4 ASPH. LUMIX G LEICA DG SUMMILUX 12mm /F1.4 ASPH. for Micro Four Thirds. Lens mount Micro Four Thirds. Lens type Single focus lens. Focal length (wide angle side) 12 mm. Focal length 24 mm. 100% genuine Item.